The average price range of a complete homeschool curriculum package (for a full year) with student textbooks and teacher materials is usually around $375 to $575 for a full year's curriculum. Pricing is determined by grade, number of subjects, copyright dates and extra workbooks, tests etc. The price you pay is up to you! Before calling us, please read more to answer the most frequently asked questions. A free teacher planner is included with each package! In a hurry? We usually ship within 2 business days! We have over 25 years experience in curriculum development. We specialize in Secular Homeschool Curriculum Packages, however we can include religious materials upon request. It's up to you. Purchasing a secular homeschool curriculum can get very very expensive and making the right choices can be very time consuming. Let us help take the pressure off! We know textbooks! We can help you save time and money by recommending used materials from secular publishers while personally developing your secular homeschool curriculum. Remember, the price you pay is up to you! We also offer Pre-Packaged Homeschool Curriculum Kits. and available subjects for each grade. 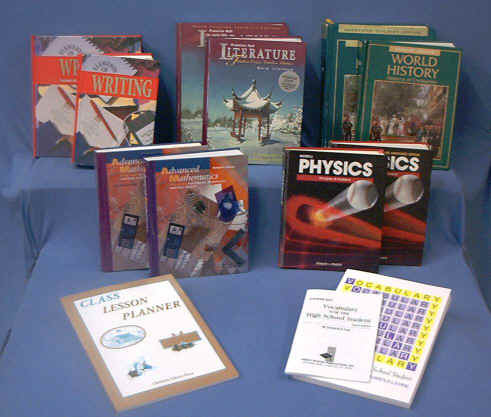 Student and Teacher materials provided for each subject. Remember, you may choose any or all of the subjects. History, Social Studies, Geography, Government etc. Economics, Foreign Language, Health, and many more. Health, Oceanography, Anatomy & Physiology, and more. Health, Oceanography, Anatomy & Physiology and more.